I had the pleasure of going to see Trampolene live in Glasgow on Friday night,I was really looking forward to seeing these guys play live. I have seen Trampolene a couple of times and always make the effort to go and see them playing. 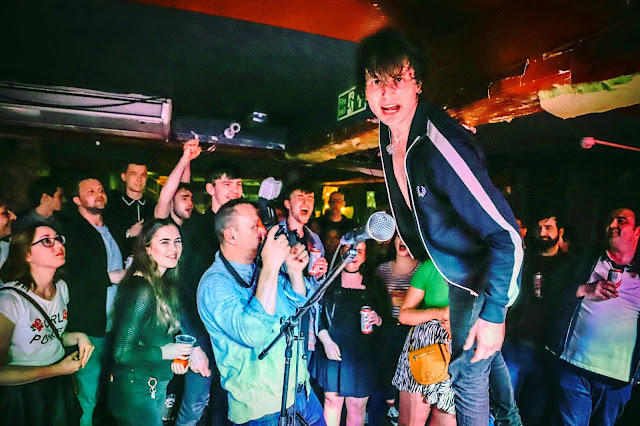 Trampolene have a very honest relationship with their fans, interacting on social media and at gigs during their performance and afterwards in the bar. they have a reputation as a fans band for this reason,normal guys playing in a band they just happen to be extremely talented and really good at what they do. Their attitude towards fans is refreshing and is another reason people are drawn to them. Artwork of youth plays out from the speakers.Rob Steele:drums,Wayne Thomas:bass and vocals and Jack Jones:lead singer and guitar, jog onto the stage. Jack Jones has a can of Red Stripe lager in each hand likening himself to Jesus except without the wine! Out of the crowd comes a man that looks a lot like Jesus,long haired,long beard he shout's "I'm here! You're looking for me?" Laughing Jack Jones introduces It's Not Rock And Roll however The White Stripes Seven Nation Army comes blasting out,not what was expected at all, a few seconds in and the familiar chords of Its Not Rock And Roll can be heard belting out the amps. "How are we all tonight?" asks Jack, various shouts of agreement that it's a good night can be heard before the funky melody of You Do Nothing For Me can be heard playing.The fast paced screeching tune has people chanting and clapping it really gets the Glaswegian crowd going. The speed at which these lads play their guitars is exceptional. They have the ability to throw out a massive tune early in the set and hit every part of it precisely and give us something that instantly raises your expectations of what to expect next at a their gig. The third song of the night Alcohol Kiss and they have the place absolutely buzzing. The crashing cymbals and reverbaration in the firsts few seconds of this song send out a wave of pure exhilaration.This is a slightly different version tonight,slower in the middle.The audience get behind this rendition.You are able to hear the quality guitar skills of Jack Jones and Wayne Thomas during this version. Trampolene are a band that can take one of their own songs,a fan favorite,change it and still have it sound as good as the original. Never the less this version is still a cracking good song. Trampolene are clever in the way that they mix personal opinions/feelings,politics and humor into their lyrics and music. Each of their songs captures a different musical genre and emotes a new feeling.They take you on a journey from a happy,quirky vibe to a raw,gritty vibe with some sadness thrown in for good measure. Hollow tapping sounds emit from Rob Steele on the drums,the beats bounce back,fast and fuzzy with a melody that lifts you up it can only be Imagine Something Yesterday"It's not who I am it's who I'm gonna be" is part of a line in this song, I look forward to watching this band evolve and see what they become. Jack shares an anecdote about prescription meds and the like so we go from A to B via K into the poem Ketamine. Jack Jones is in the crowd wandering through saying this poem passing the Mic to people so they can say some of it,word for word a mix of Jones and various fans spit this poem out,loud happy cheers shout out.This is another reason why Trampolene gigs are fantastic the audience are encouraged to take part in songs and poems at their gigs. Dreams So Rich Life So Poor has similarities to some of the music produced by The Who,it's raw and sounds as there should be an accordion or some other instrument like that in one of the hands of the band members. Beautiful Pain has the opposite sound it's slow and delicate in comparison but the energy level never falters. Moving swiftly from song to poem and then back the gig is winding down. Time for a couple more classics Tom Hardy and Friday I'm In Love fill the basement venue. Tom Hardy is a firm favorite,the lyrics are extremely witty and put to a rowdy assault of guitars and drums, they produce a top quality song that makes an impact as soon as you hear it.The final time we will hear Trampolene play tonight but they do not disappoint, Storm Heaven is quite a personal for the lead singer Jack Jones, the title is something his grandfather said to him. This is a monster of a song, huge riffs, huge beats one feisty tune.Storm Heaven show cases each of the band members talents separately and together, lots of layers in it. Rob Steele provides some thunderous quick beats,it is quiet in parts then builds into a melodious roar. Jack Jones is off stage passing his guitar around letting people play it. He hands it to a guy that could play really well,not wanting to have all the fun he passes it to another lad, he plays really well too. Rob and Wayne seem to be engrossed in the jamming session that is taking place now, Jack watches him playing,he seems quite impressed. He looks up gives everyone a wave and heads back stage but not for long.He has more cans of Red Stripe this time shaking them up and spraying all of us in the place with lager. Getting his guitar back they finish Storm Heaven in true Trampolene style, rocking out until the very last note. The Mic has been turned off but they're not done yet Poundland is the last poem and the end of the gig. Jack is hoisted up on to the shoulders of two men who are tall as is Jack Jones and in a basement bar is maybe not the best decision. He starts the poem and someone shouts out " I got something for fifty pence in Poundland the other day." a laugh and Jack replies "There's always one! It's meant to be a Poundland!" continuing with the poem it's being said back word for word. Brilliant way to end the gig. Trampolene finish they receive rounds of applause, whistling and cheering. The night ends on a high. Wayne Thomas and Rob Steele head back stage and Jack Jones heads into the crowd where some people want to have a chat about the gig and grab the chance to get a quick photo. Trampolene are a fantastic band they are very individual in their sound.lyrics and style.I think that they will be playing big,sold out shows in the not to distant future.They definetley have the drive to succeed but more importantly they have what it take musically there is no doubt in my mind that they are destined to go far in the music industry. 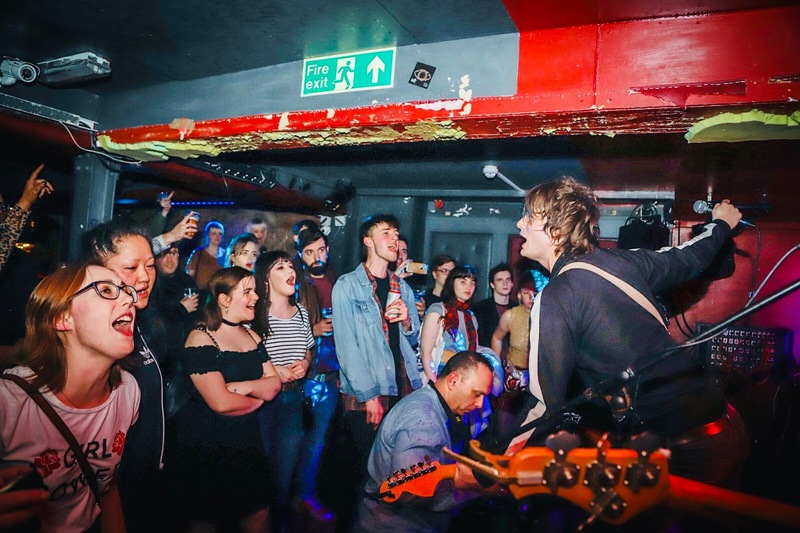 I can't think of another band at the moment whose gig you can attend and be treated to variety of styles of music that you get at a Trampolene gig. I thoroughly enjoyed their gig on Friday night and intend to catch Trampolene anytime the play in Scotland. 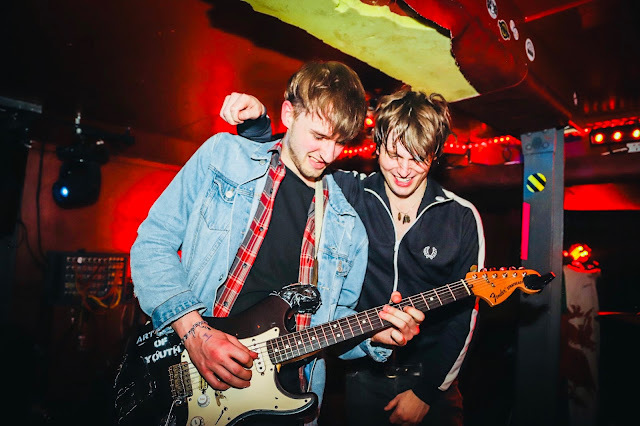 Trampolene play their biggest headline gig in may at the iconic venue of Scala in london. This is an absolute must see event, it is an awesome acheivement to be playing in Scala. 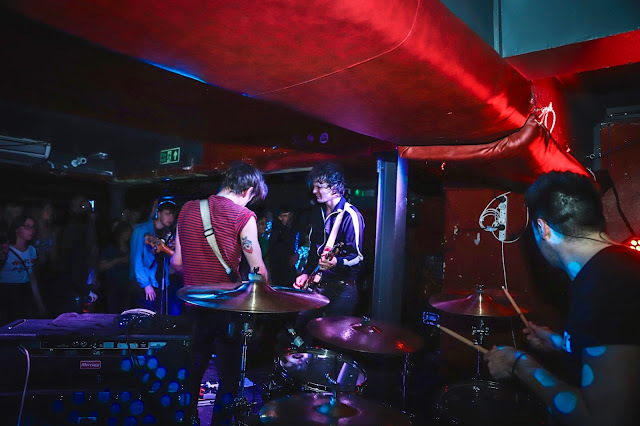 Trampolene won't be playing in small venues forever they are rocketing towards a big future. Trampolene are one of the more interesting bands on the U.K music scene. Trampolene have a debut album called Swansea to Hornsey. They are on a British tour and are playing lot's of festivals over the summer, plenty of oppotunities to go and have a listen . You won't be dissappointed.